If you’re looking for file cabinets that will help you stay organized and de-clutter your office, you should purchase pedestal file cabinets. Pedestal file cabinets include small drawers and one file drawer. These cabinets can come in standard contoured plastic pull or recessed metal pull. The file drawers are constructed with high walls so folders can be suspended and fully extend out to give you and your employees 100% complete access. A steel ball with suspensions allow for this smooth operation. The counterweights installed within the pedestal files ensure you will never have to worry about your file cabinets tipping. 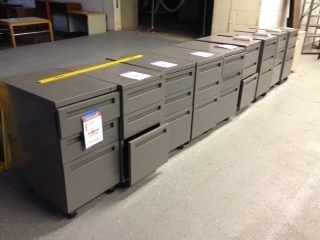 You can even purchase mobile pedestals with easy rolling casters to make your file cabinet locations flexible. For high durability and affordable pedestal file cabinets, come to Mark Downs Office Furniture. This entry was posted on Friday, September 14th, 2012 at 8:18 pm. Both comments and pings are currently closed.